The twinkle lights created a lovely ambiance, the ice was smooth and flawless, families were having a wonderful time looping through the trees and it felt great to have the blades back on. 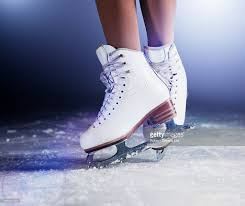 Although I never competed, in my youth, I spent hours upon hours skating at local arenas and on backyard rinks. As a teenager I taught figure skating for the local optimist club and as a parent I loved teaching my own children how to skate. My husband had wonderful patience as we tried our hand at several backyard rinks over the years. So, it was with great excitement that we decided to spend the Saturday night of the Family Day weekend at Storybook Gardens. The first few laps were a little rusty, but then the blades felt strong and natural. Our conversation meandered through a variety of topics, just as the pathway meandered through the beautifully lit trees. I recall feeling confident about turning the upcoming corner, but then within the blink of an eye, instead of catching the side of the blade, I caught my front pic and crashed to the ice ~ knee first. Following any such tumble, one’s natural instinct is to get up and move on, without causing too much of a fuss. But as my brain was sending a signal to my right knee to bend so that I could get up, it became instantly apparent that this injury was going to result in more than just a bruised knee. Fast forward two weeks… Following the news that indeed I had fractured both my knee and my right femur, which required 24 hours of traction followed by surgery which left me with a lovely plate, a rod and several screws, I was home and on the road to recovery. Life has certainly slowed down. I fill my days with reading, writing, watching the beloved miniseries North and South (if anyone can inspire one to wellness, Patrick Swayze can), completing jigsaw puzzles (a past time that is usually only enjoyed at the cottage or over the Christmas holidays) and enjoying the company of friends who have been so wonderful about popping in ~ all from the comfort of my couch! I am determined to be the best patient ever, so that I can return to work as soon as possible. As the beginning of this month came upon us, I shuffled (my new mode of mobility, with my ever so stylish walker) to the kitchen and switched the calendar page. I have been a fan of Catherine Simpson’s work for years and each Christmas my daughter faithfully gives me one of her calendars. I always get a sense of wonderment as I turn to a new piece of artwork. March’s artwork took me aback as I couldn’t help but see the irony in the picture. 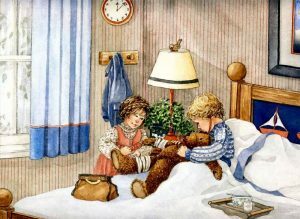 The caption was “Under the Weather” and the picture was that of two young children tending to a Teddy Bear, with an injured right leg. I have suppressed the urge the check out what April’s artwork might be. Here’s hoping it involves dancing, walking and jumping (without the stylish walker).